ACTIVISM. 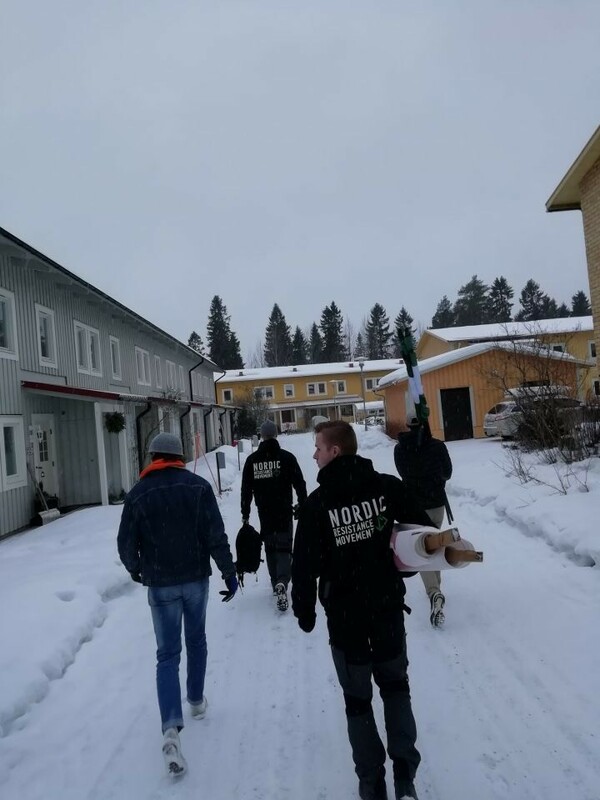 Two young activists from the Nordic Resistance Movement detail how they turned this year’s Spring Break in the city of Umeå into a productive week of activism in service of the struggle. 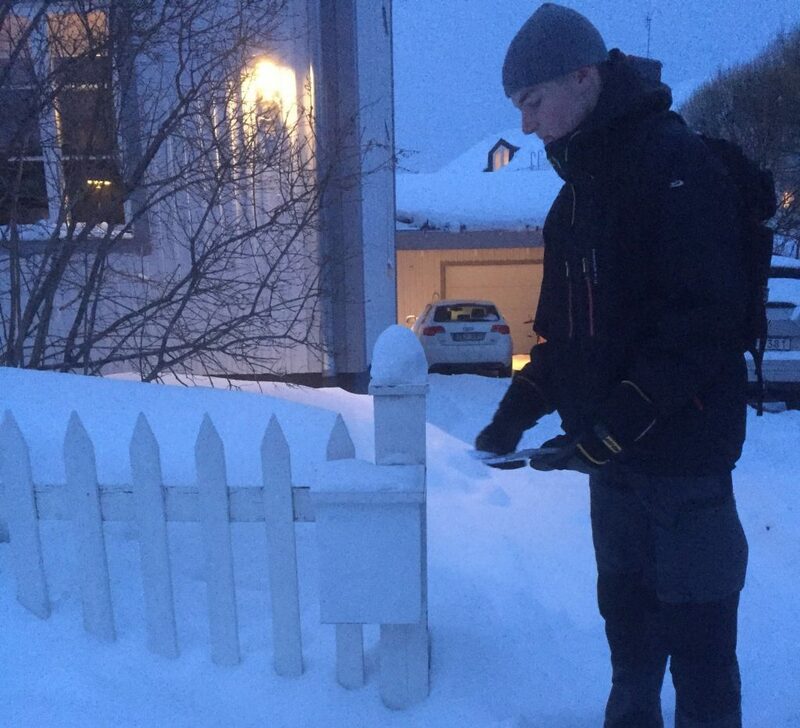 The first week of March marked Spring Break for the youth of Umeå in northeast Sweden. This annual school holiday is usually a time when the majority of young people spend their days playing video games, watching TV or getting drunk at parties rather than doing anything productive. We saw this as the perfect opportunity to change the Spring Break culture and rebrand it as a week of youthful activism. The task of mobilising Umeå’s youth for National Socialism has been made more difficult on account of the city’s Marxist character, which is largely a result of its university and left-wing students. It’s a place where nationalism, conservatism and love of one’s people or culture are always being attacked. 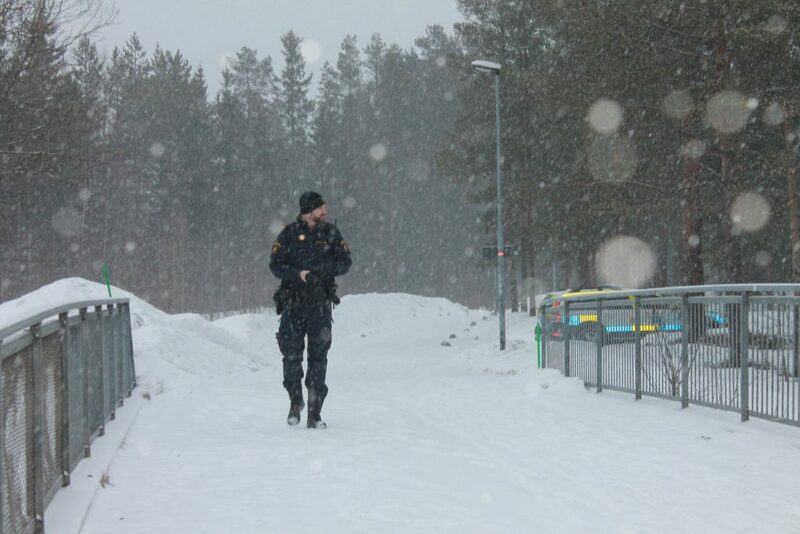 Yet the struggle in Umeå is no insurmountable task but rather a challenge, a challenge we will succeed in. 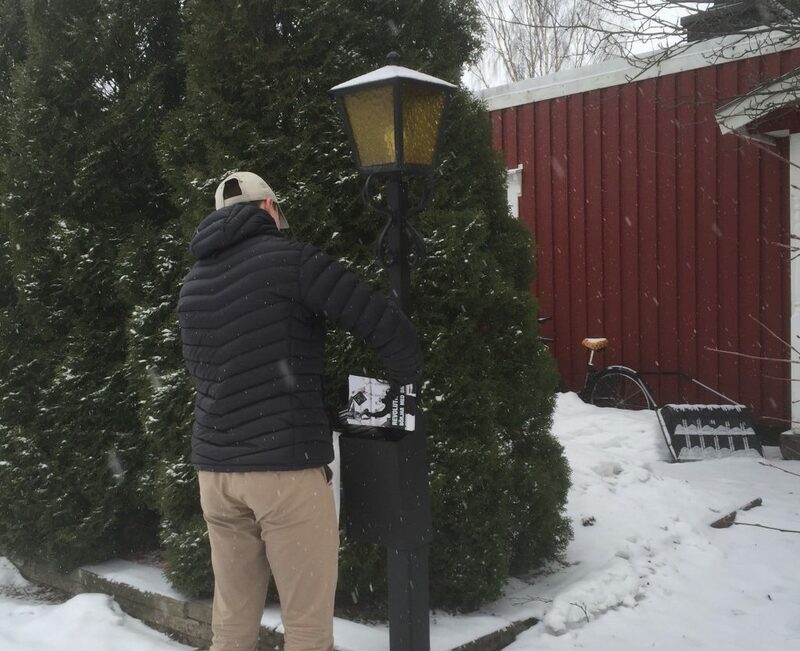 Our struggle in Umeå is making constant progress, and in this article about our activism over Spring Break, I will focus on our successes in local youth circles. 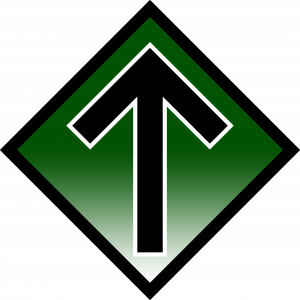 I, Hugo Edlund, and my comrade, Herman Bengtsson, are young men ourselves, and over the course of our awakening, we have experienced most things young National Socialists can experience. This has included psychologists who try to “cure” us of our worldview, police who play us films of the grotesque “Holocaust” lie, interviews with social services, parents who arrange meetings with “defectors” from the “anti-racist” group Exit, reds who leave us threatening messages, pressure from the Swedish Security Service, expulsion from the armed forces, and so on. The list is long. We young folk have much to contribute to our people’s struggle for freedom. We are not just more revolutionary; we also have the social advantage of being in daily contact with other young people in school and therefore have the opportunity to spread National Socialism and recruit new members. Due to our experiences and our strong desire to awaken the youth, we have been very successful lately. Both Herman and I have long acted as contact people for youngsters in Umeå, and we can report that teenagers in the city are slowly but surely beginning to change their views. 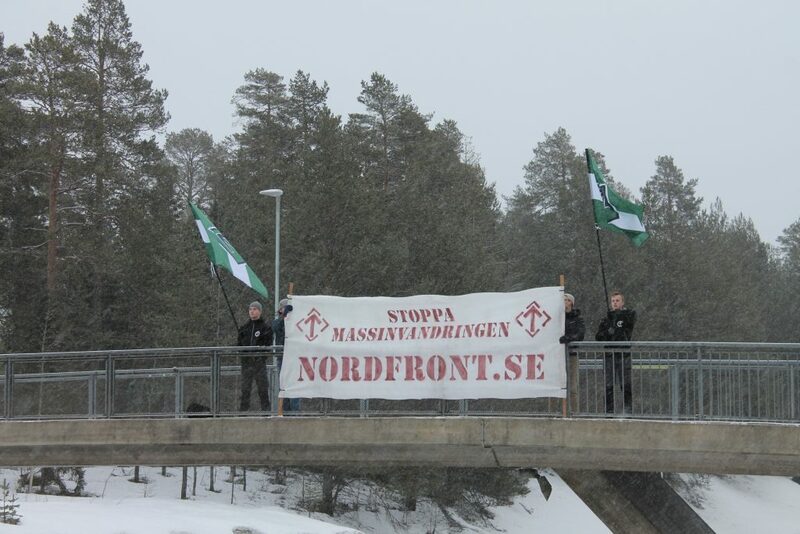 The local youth have shown a great interest in the Nordic Resistance Movement. They have asked us a lot of political and ideological questions via social media, they have requested leaflets and stickers, and they have also asked to meet and become members. 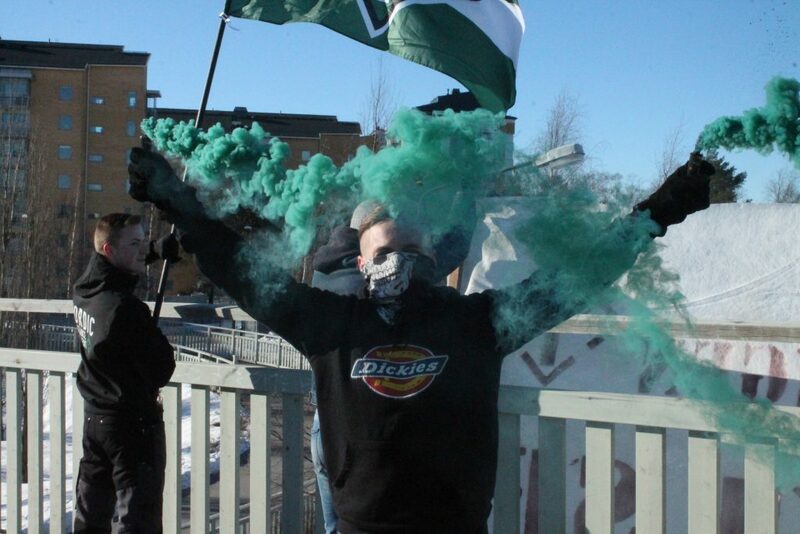 The “anti-racist” group Fight Umeå (Kämpa Umeå) are upset that more young people are being recruited in Umeå and that youngsters in general are becoming more radical. In the above post on their Facebook page they urge people to oppose the National Socialist youth. 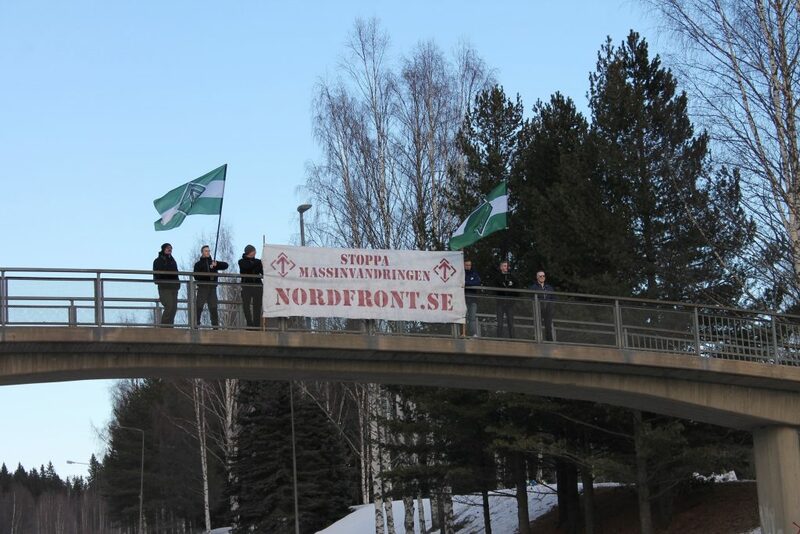 On Sunday we held a public banner activity on a bridge in the Haga area of Umeå. 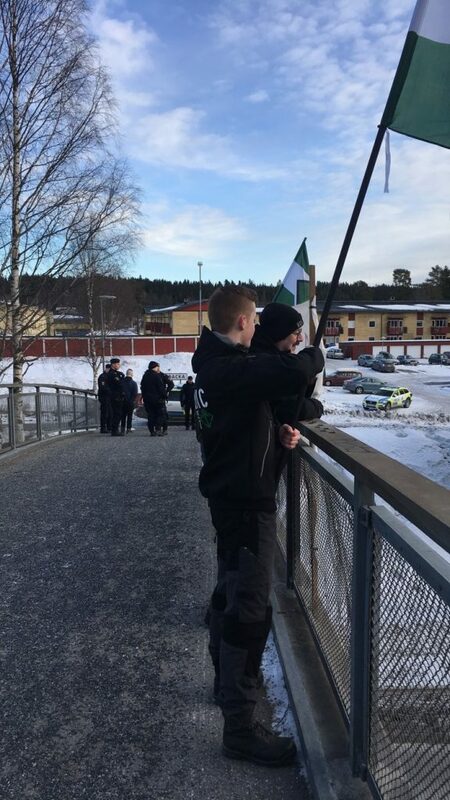 Members and young sympathisers gathered together and went to the bridge, where we unfurled a banner with the message “Stop Mass Immigration” and held Tyr Rune flags. We stood undisturbed on the bridge and the activity passed smoothly. The banner’s message drew all possible types of reactions, from thumbs up to more negative hand gestures. 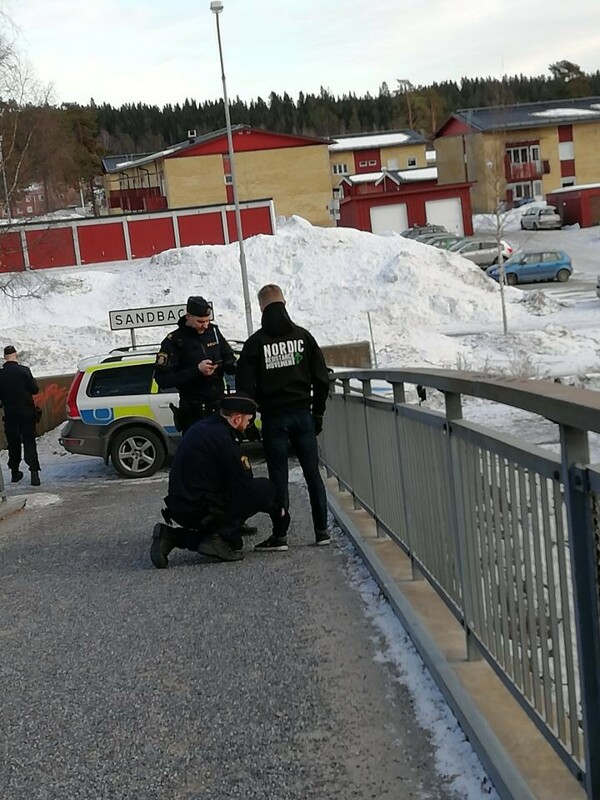 After 25-30 minutes the police showed up. Despite their “lack of resources”, a total of three patrol cars came to the scene to investigate the activity. The police then stood in a group at the side of the bridge and observed the activity for about ten minutes, after which they carried out a Police Law 19 body search on all the activists. After all the comrades had been searched, without anything being found, the banner action continued as planned. The police then went on their way, apart from one patrol car that remained to watch the activity. After an hour and a half, we decided to head back to the rendezvous point before socialising and discussing the day’s events together. On Monday 200 leaflets were distributed in the Umedalen area of Umeå. 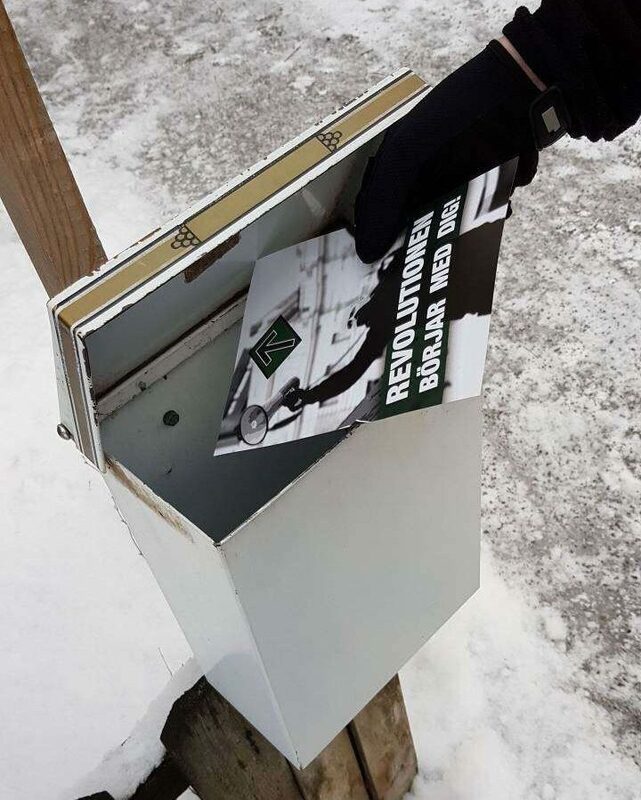 On Tuesday 400 leaflets were distributed in the Teg and Böleäng districts of the city. 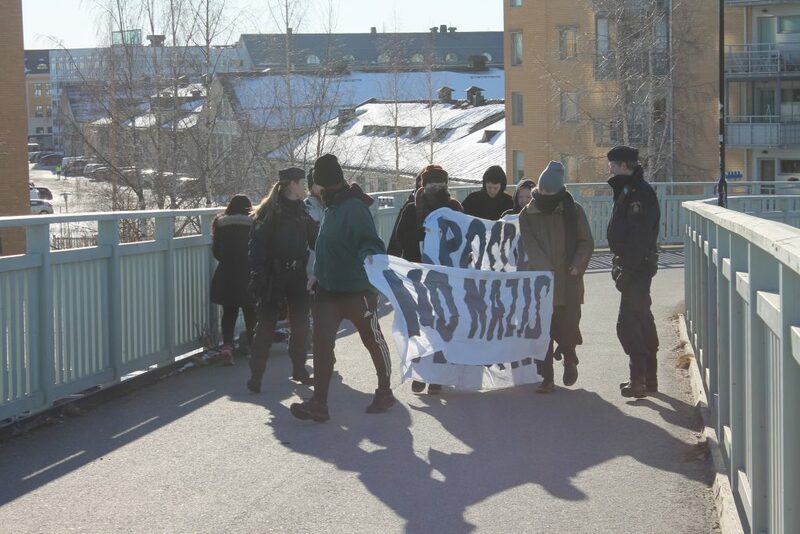 On Wednesday activists held a public banner activity on a cycle bridge over a road heading to Umeå garrison. After meeting up and travelling to the bridge together, we unfurled the banner and flags. This time we also had green smoke grenades to make us more noticeable to drivers, cyclists and pedestrians. After we had stood on the bridge for 40 minutes, a patrol car showed up. Two police officers came over to us and asked who was responsible for the activity, to which we answered that we didn’t know. One of the police mentioned some kind of green smoke but admitted she hadn’t actually seen it herself. After conversing for a while, the police stood back and watched the activity from a few metres away. A little while later, a well-known and aggressive Marxist showed up on the bridge, presumably because the police were now there to protect him. The Marxist immediately started asking the police why we were allowed to stand there, how easy it would be for them to arrest us on the spot, and that he would stand up for his right to freedom of speech. 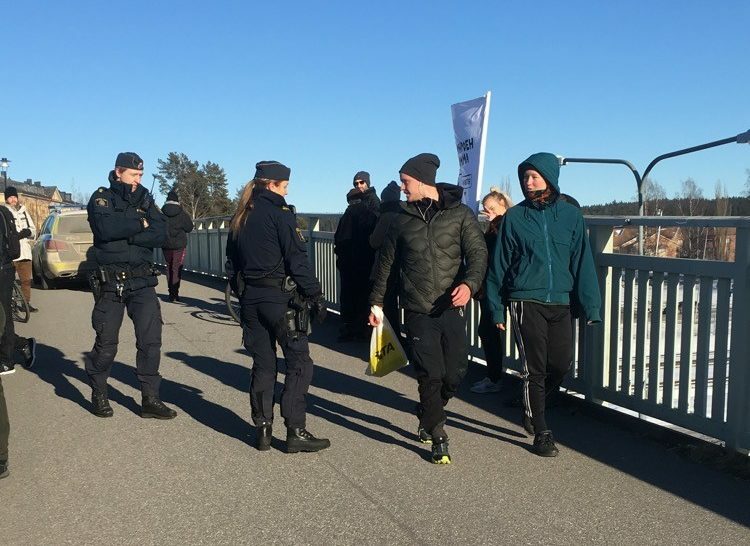 The Marxist, or Marcus “Gråbenson”, was met with opposition by the police, who said we could stand on the bridge if we wanted to and that they would protect our rights. These comments made Marcus even angrier. By now word had spread that National Socialists were standing on a bridge with flags and a banner. 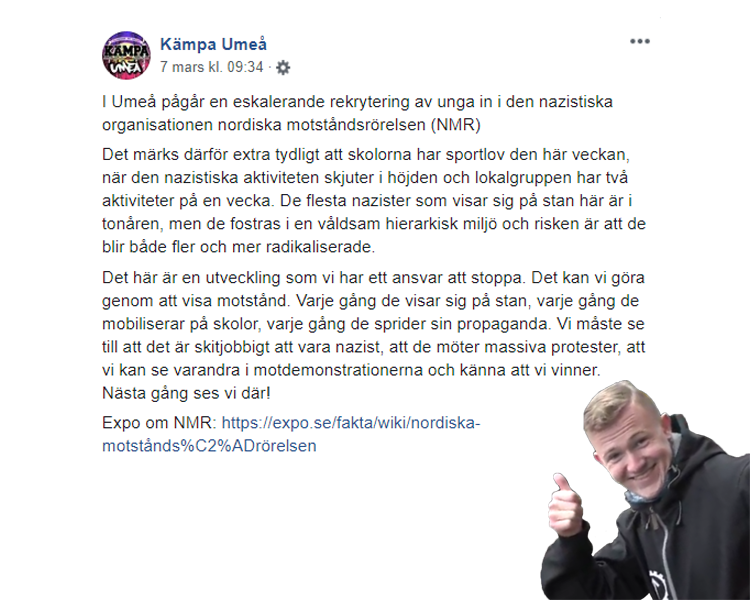 “Anti-fascist” groups Fight Umeå and “Not Racist, But…” posted social media messages about the ongoing “demonstration” and encouraged people to go there. After a while, we could see that some reds had gathered on a street under the bridge. They looked like a very sorry bunch, with the majority of them being small girls. There were seven to start with, but their numbers increased to nine after a while. Upon arriving, the reds used cable ties to put up their two banners beside ours. One of them read “Crush Nazism”, but when we asked why they didn’t “crush us” when we were right there, we didn’t get an answer. The activity continued despite the reds’ presence, although our ears had to endure the aural equivalent of cancer when they started screeching their age-old “No racists on our streets” chant down a megaphone. There were a few disputes between the groups, including one in which the reds explained to everyone that we weren’t white but “pale”. The reds were asked what was healthy and progressive about mass immigration, but none of them could answer. When a comrade gave an example of what is destructive about mass immigration, one of the reds asked the female police officer if what he’d said was an example of racial hatred. She answered that it wasn’t. After we had stood on the bridge for about two hours, we decided to call it a day and head home. 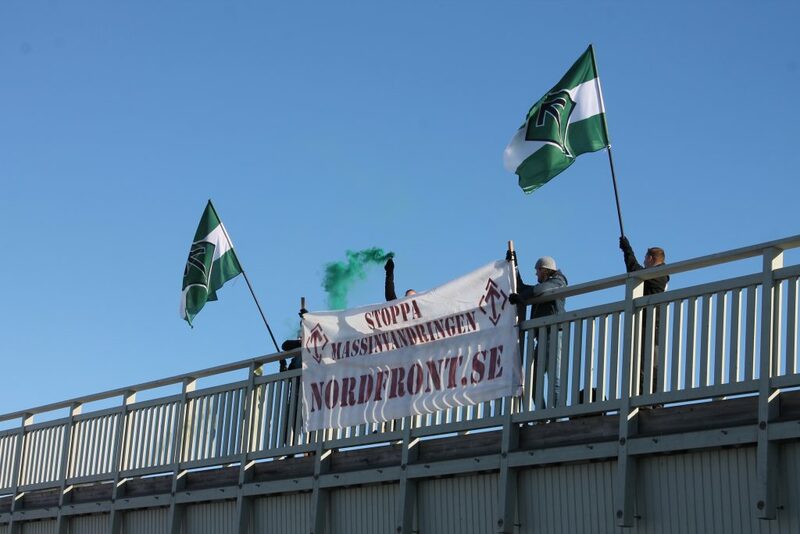 On Thursday 400 leaflets were given out in the Grisbacka area, after which the comrades held a public banner activity on a bridge over a road heading to Mariehem. 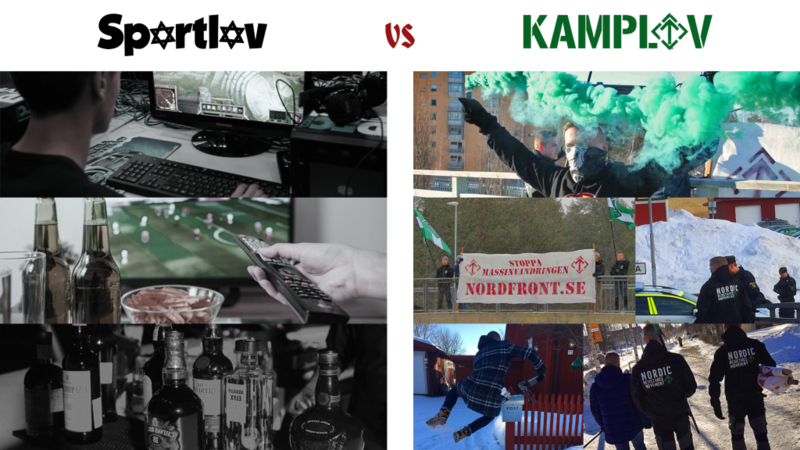 Fight Umeå put a post on Facebook after Wednesday’s activity (visible higher up in this article). 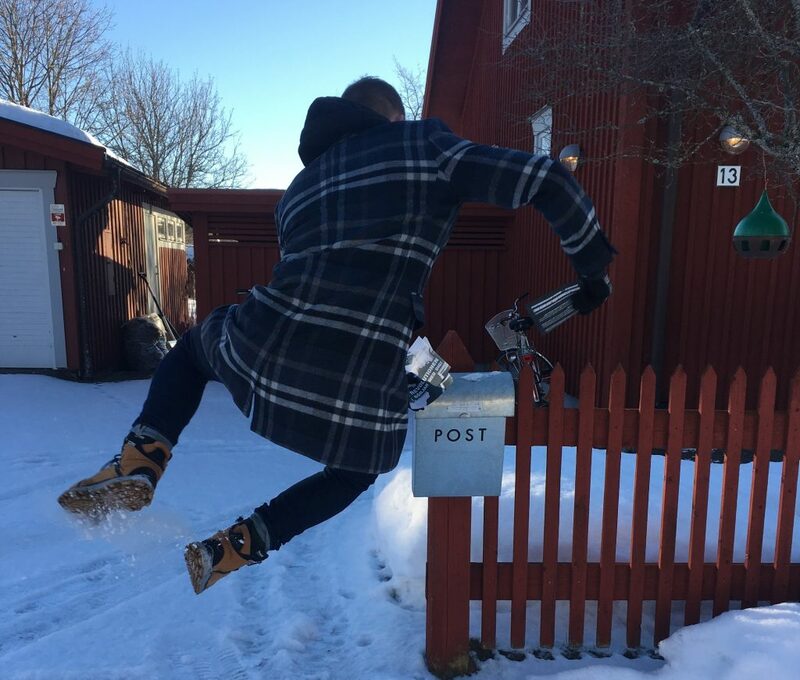 In the post they urged people to show resistance to the “Nazis” in Umeå and threatened to stop us and “make it difficult” for us to be National Socialists. Members and young sympathisers therefore thought it would be fun to hold another public banner activity. Upon arriving, the comrades set up in the usual manner. It’s worth mentioning that Mariehem is a more multicultural area, which was evident in some of the motorists’ reactions. There were still positive responses, however, with some drivers being so sick of the multicultural hell that they gave a certain salute in full view through their windscreens. After an hour the first patrol car turned up. A single policeman walked over to us and said people had phoned them and complained that “Nazis are standing on a bridge and screaming ‘Sieg Heil’, giving ‘Nazi’ salutes and being threatening and aggressive to passers-by”. We were so surprised by the claim that we all laughed out loud, whereupon the policeman realised that it had probably been political opponents who had made the complaint. After the officer had unsuccessfully enquired who was in charge of the action, he wished us good luck and moved on. An hour and a half later, we decided to pack up and head home. 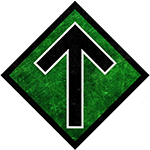 All the comrades were surprised that it wasn’t actually difficult to be a National Socialist after all, and that Fight Umeå only write empty words. 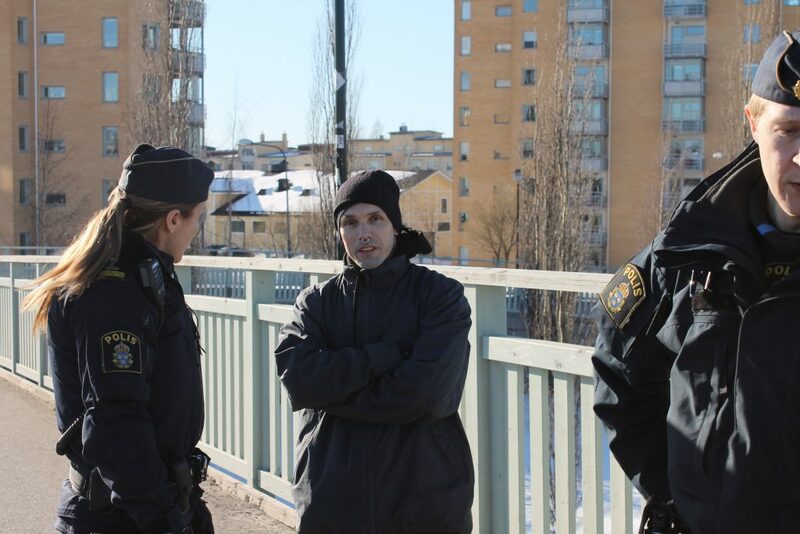 On Friday 150 leaflets were distributed in the Tomtebo area. The Nest held their monthly meeting in Umeå. The meeting provided good food, socialisation, and interesting speeches on the subject of law. On Sunday 500 leaflets were distributed in the Haga area. Altogether, we gave out 1,650 leaflets and held three public banner displays throughout the week. We hope more local youngsters will join us in the struggle and take part in our continued campaign for our people’s survival and freedom. We give the youth of Umeå a promise: Every school holiday will now be an activism holiday!